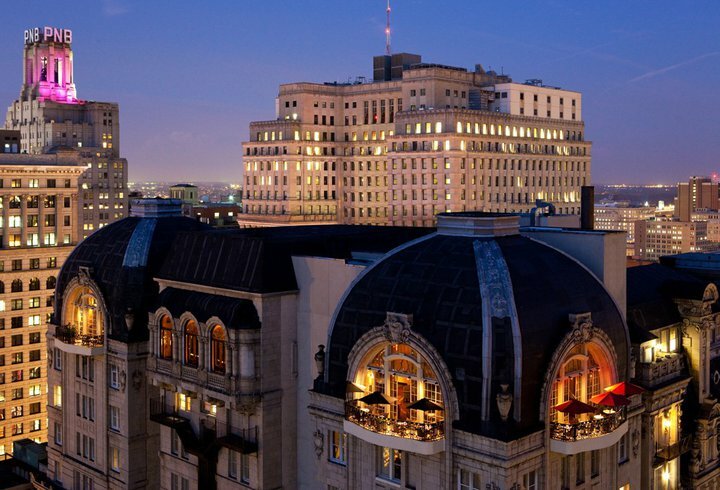 I was in desperate need of a getaway, so this Friday night my friend and I got a last minute hotel deal at the Hyatt Bellvue in Philadelphia and made plans for an 18 hour girls retreat. We packed up the car after work and headed out to enjoy our mini “staycation,” which was to include a beautiful dinner at XIX Restaurant on the 19th floor of our hotel. XIX is known for its luxurious dining room and incredible views overlooking the Philadelphia city skyline. Sara and I were lucky enough to snag a table outside on the balcony—along with 3 other couples, who were clearly in the early stages of dating, as we listened to the men desperately attempt to impress their female companions. I have never rolled my eyes so many times while simultaneously being grateful for my single status. This being said, it is a beautiful place to take a lady on a special occasion! 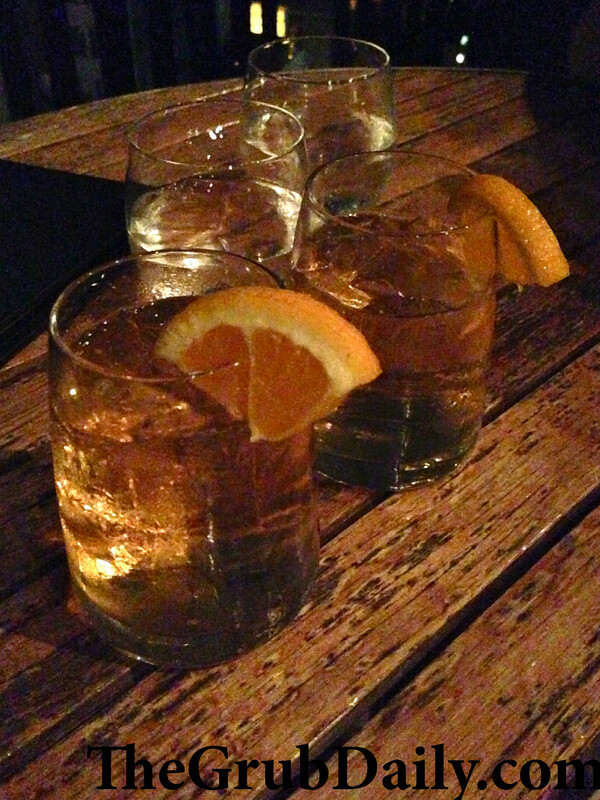 We got started with a round of cocktails called the Kentucky Straight Orange, made with bourbon, orange bitters, and elderflower liquor. It was much sweeter than I was expecting a bourbon-based cocktail would be, but I attribute this to the elderflower liquor, which did grow on me as I sipped it down. I tend to prefer straight manhattans, but this is a great way to work your way into bourbon, if you’re just starting to experiment with it! 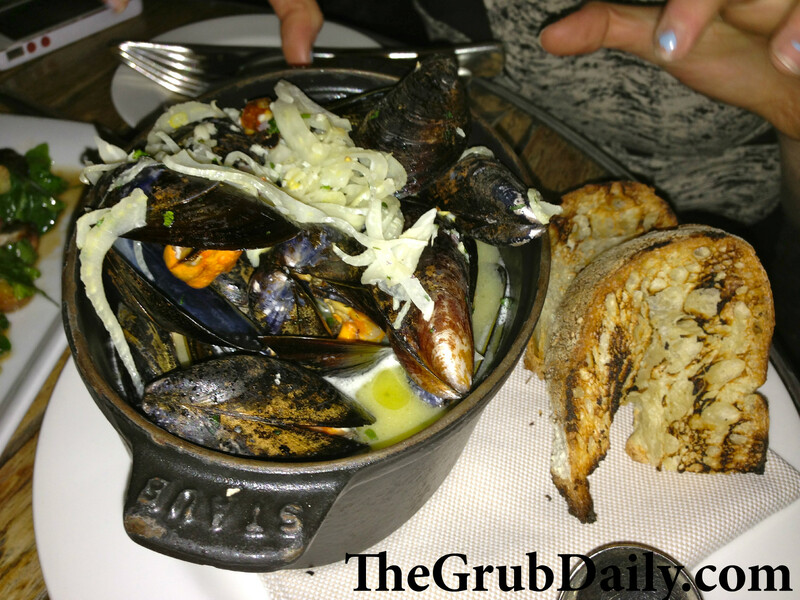 Next we ordered the Steamed Blue Bay Mussels in white wine and garlic sauce with fennel ($12). I would definitely have to rank these in my top five mussel experiences. They were meaty, and the sauce was obnoxiously good with thinly sliced fennel garnishing the top of the dish. The grilled sour dough bread served alongside the pot of mussels was perfect to soak up the remaining sauce. The only complaint I can find with this dish is that ¼ of the mussels in the pot were closed shut—and everyone knows you shouldn’t eat those suckers! 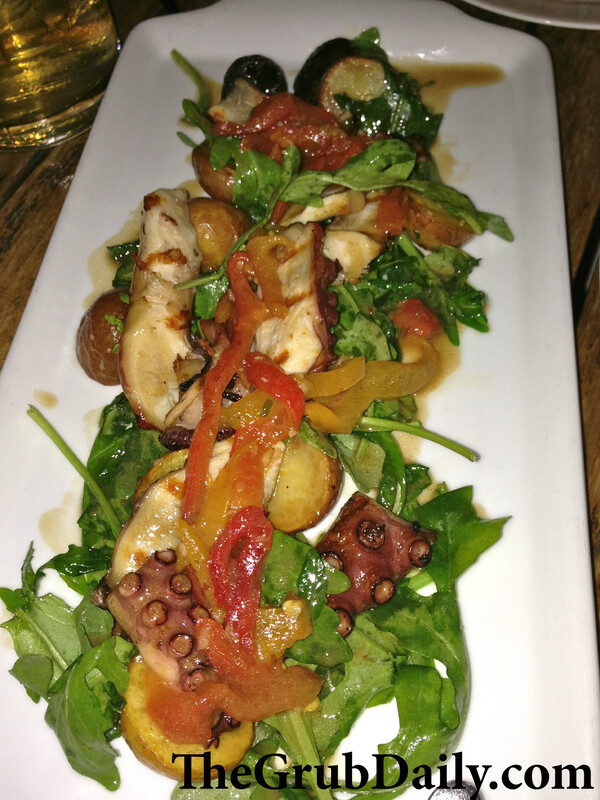 As I began coming down from my euphoric mussel experience, the waiter arrived with our second appetizer: Grilled Spanish Octopus served on top of a bed of baby arugula with sweet peppers and fingerling potatoes, dressed in a sherry vinaigrette ($14). I would consider myself an octopus/calamari connoisseur because I order it out whenever possible, and this was the second best I have ever tasted, ranking just behind Mario Batalli’s grilled octopus with limoncello vinaigrette. For those of you that don’t know, Chef Batalli is famous for his grilled octopus, so that is saying A LOT! The meat was not rubbery and the delicate balance of acid in the vinaigrette was perfect. Finally it was time for our entrée, and I just didn’t know if it could even compare to the appetizers, but it certainly did! 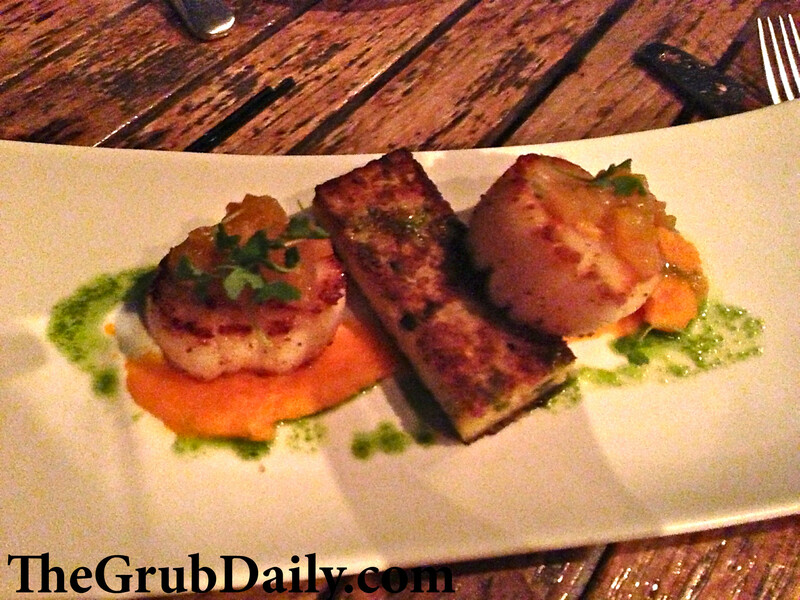 We split the Pan Seared Diver Scallops with spicy poblano chili polenta, carrot puree, and mango ginger chutney ($32). The scallops were so perfectly cooked and the flavors of the mango, ginger, and carrot were very interesting and brightened the whole dish with a fresh taste. The polenta cake was definitely spicy and just the perfect size portion to compliment the scallops. Bottom line, I would definitely go back to XIX for dinner and I hope to one day go for their brunch, which I heard was out of this world (I can only imagine based on last night’s meal!). I thought the price point was completely reasonable for the atmosphere and quality of the food. My only gripe with the restaurant was the service, and that is primarily because our server got way too involved in our ordering decisions and side conversations. At times, we actually thought he was promoting other local restaurants because he seemed to be trying to recommend we go everywhere else in Philly for similar food. It was bizarre and quite annoying. But I will be back….hopefully sooner than later!